Adventures from a fat cat's kitchen. What do you do if you have a bunch of lunch meat and you really want a sammich? You could slap that lunch meat between some cheese and nice green leafy lettuce (not iceberg lettuce, yuck). I mean that is pretty delicious with some mayo in there too. Or you could make my flaxbread recipe. But what if you want pulled pork? Or a cheeseburger? Or low-carb Sloppy Joe's? Aside from eating all the many delicious sandwich type things with a fork and/or knife (or with your bare hands like a boss), what do you do!?!?! Okay, okay. I know this isn't a crisis and there are many alternative breads and things you could try, or just not have them at all. But what I have here are light and fluffy egg buns! BEFORE I CONTINUE: I did not create this recipe! 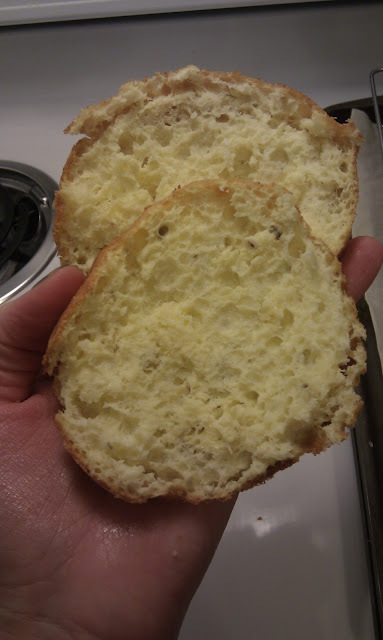 I scoured the world wide web for freaking ever looking for a light, fluffy bread alternative. I found one. 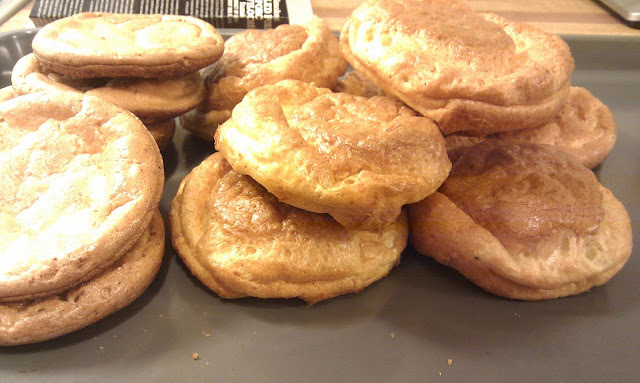 Please, please check out Fluffy Chix's Revolutionary Low-Carb buns. Now, I have not made the same recipe that Fluffy Chix provides which is why I am making this post. The recipe I've used is rather similar but missing a few ingredients (when I found this recipe I didn't have all those fancy ingredients, so I skipped them! No disrespect to FluffyChix for using such ingredients, or those of you who prefer to use her recipe. ), so I like to think of this as a simpler contribution. 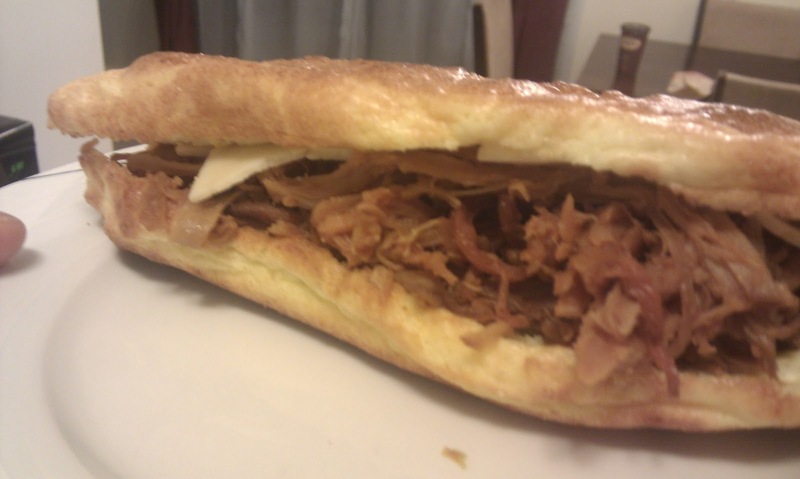 slow-cooked (12 hours) pulled pork on light and fluffy egg buns! And I spilled some baking powder on my counter which is why it is on top of this bun. Whoops. * Don't be intimidated, separating eggs is super easy! And sometimes even fun. For those of you who don't know how to do it, there are explanations/demonstrations below. ** Fluffy Chix recommends creating your own molds. I agree. Find something around your house that is the shape/size bun you want and make about 8-10 molds (for larger sandwich buns) or 12 (for smaller sized hamburger buns). I may or may not have cut my finger on the aluminum foil while making my molds, but I'm sure it is possible. Be careful! Preheat your oven to 350F. Grease aluminum molds or baking trays. You will need all 8 eggs separated, so do that now. If you're not sure how to go about this, there are a few techniques you can try aside from using an egg separator. Drain the eggs: You can gently tap a whole in the top of the egg and slowly drain the whites out, but this will take a lot of time for 8 eggs. Use the egg shells: I use this method a lot. It can be messy but doesn't take too much time. Essentially you crack the egg around the middle as best you can, without dumping the whites & yolk out. 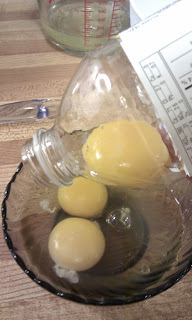 Now "pass" the yolk between the two halves and the whites will start to fall off. Use your hands: This method is messy but effective. You can either crack the egg and dump it into your hand, letting the whites fall off, or you can crack all your eggs into a bowl and just fish them out. Alright, now that your eggs are separated go ahead and get that mozzarella cheese grated too. Then, combine all dry ingredients in one of the small/medium bowls. Process the cottage cheese until it looks like yogurt and put it in the bowl with the egg yolks. 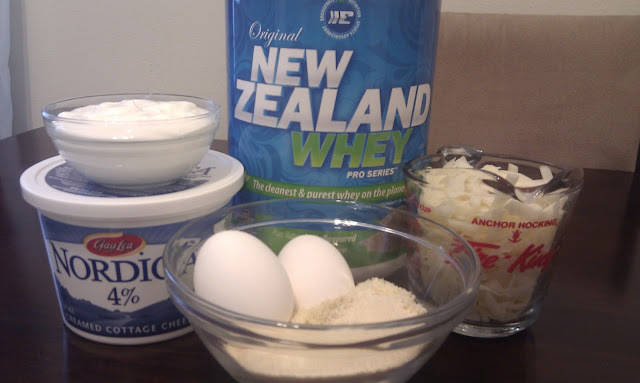 Put these ingredients, the grated cheese, and the dry ingredients, into your blender. 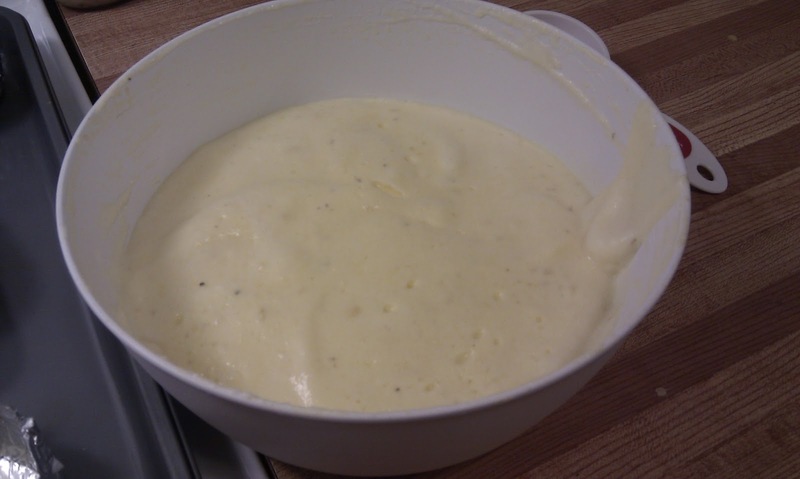 Blend until it is kind of smooth (you'll probably have some mozza chunks still). Put the mixture back in the bowl and set aside. 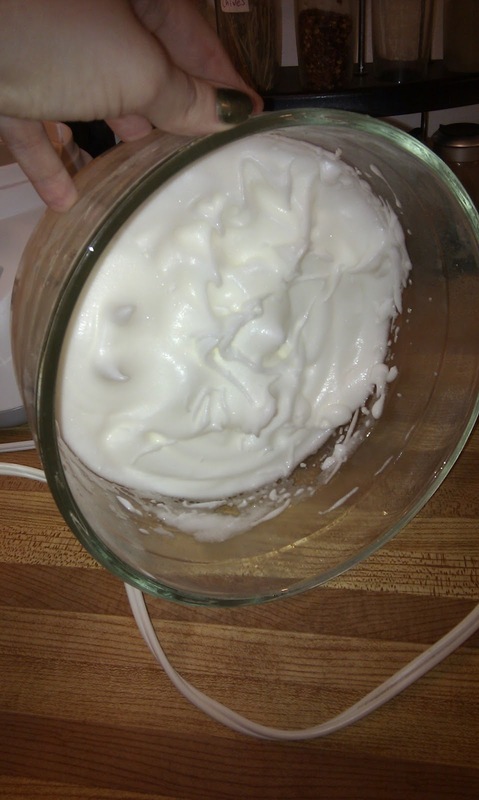 Grab your bowl of egg whites and hand or stand mixer, it is time to beat the egg whites to stiff peaks! Start out with a low speed and gradually increase to a medium, then high once the whites start to get foamy. Note: normally this would be when you add the cream of tartar as Fluffy Chix listed in her recipe, but I omitted this ingredient. The cream of tartar stabilizes the foam created with the egg whites but I have had no issues without it, which I attribute to the eggs still being pretty cool when I beat them (cold egg whites create a more stable foam, but room-temp egg whites get more volume). the egg whites are done once you can do this and not have them slide all over the place. we want "stiff peaks"! 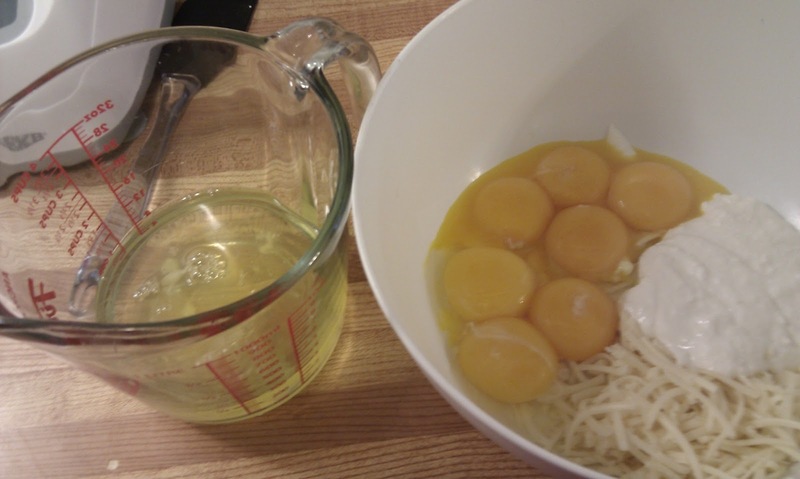 Put about a third of your egg whites into the yolk mixture and gently stir together to loosen your batter. Once the whites are incorporated, add another third of the whites and gently fold them in (folding is not like mixing or stirring! Please check out this link for instructions. Thanks, Youtube). Finally, add the rest of the egg whites and fold again. 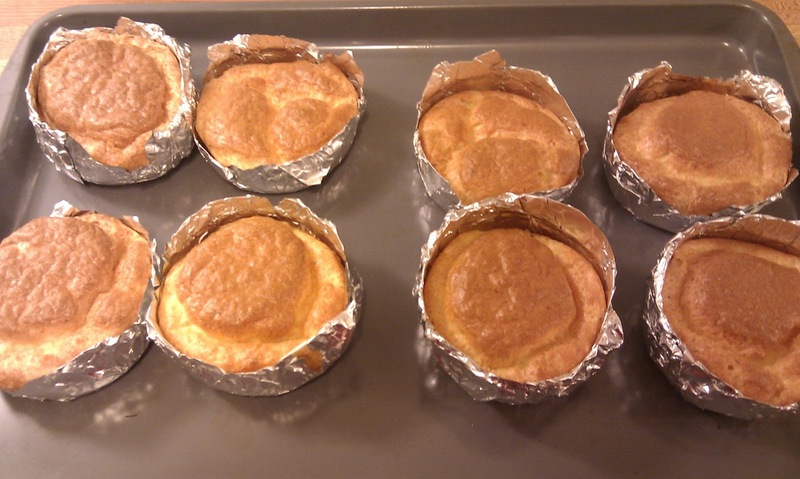 Divide your batter evenly among the aluminum molds or baking trays you're using. Put them in the oven and immediately drop the temperature to 325F. 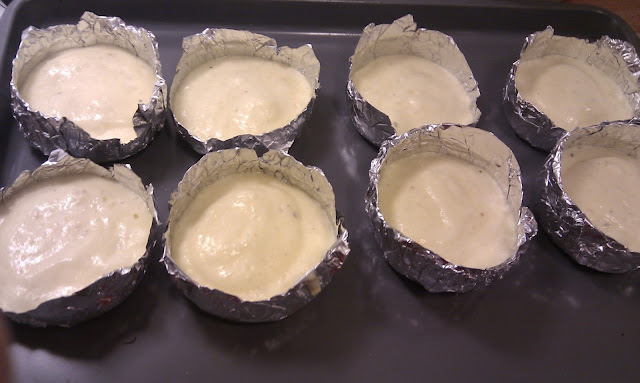 Bake for 45 minutes or so. homemade hamburger bun molds, which may or may not have cut me. A couple times making this recipe I've noticed that the buns are still sort of moist once cut. If this happens you can toss them back in the oven (cut side up) for a few minutes, but you risk drying the outside too much. Alternatively I have left them out to air for a while before actually making dinner. 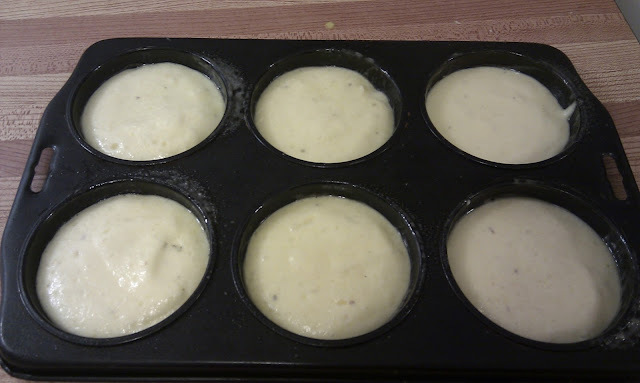 The slight moistness is not noticeable once you top the buns with things, though, so it might be a non-issue for you. Be sure to refrigerate your buns! Have you ever tried using plain yogurt in place of blending the cottage cheese to be the consistency of yogurt?